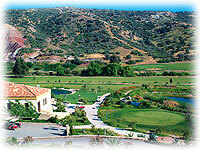 The SECRET VALLEY GOLF CLUB, located 18 km east of Paphos and 49 km from Limassol, near "Petra tou Romiou" the legendary birthplace of Aphrodite, the Goddess of Love. It lies in a scenic valley with grand trees adding to the new course's maturity and the beautiful scalped natural rock formations offer panoramic views to the golfer. 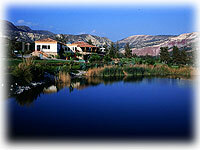 It plays to a par 72 and measures 6120 meters. Secret Valley promises players both the glories of nature and the glories of golf. The front nine offer four nice holes for warming up, two birdie opportunities and an easy dog leg (if you know how!). The back nine, plays longer than the first nine and the challenge starts immediately - no warm-up holes on this side. 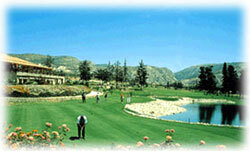 Practice facilities include putting greens, chipping areas, fairway bunkers and a large driving range. Tuition can be tailored to suit individual requirements and teaching can be on an individual or group basis. The clubhouse at Secret Valley as the one of Tsada, has a wooden interior and facilities including a fully stocked Pro shop, locker rooms, bar and restaurant with verandas overlooking the artificial lakes and the golf course. Down town in Pafos, visitors can explore the city day or night with safety. A myriad of night clubs, restaurants and bars which keep even the most ardent night owl occupied. HOLE Meters PAR . . .